TrueClot® Blood Simulant “clotted” with TrueClot® Clotting Solution to simulate hematoma. The use of medical simulation has grown significantly at educational institutions, many of which now have Simulation Centers. TrueClot® can be used with high fidelity patient simulators to simulate hemorrhage or combined with our Clotting Solution to create tissue avulsion and even hematomas. 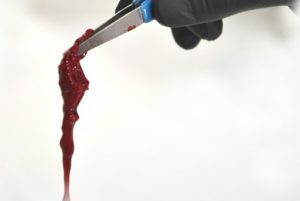 TrueClot® Blood Simulant has also been used to perfuse post-mortem human specimens (cadavers), where partners report realistic simulated bleeding and returning skin and other tissue to a healthy red or pink color.